The Grand Seduction opens in theatres next week, but there’s a hidden gem of Canadian cinema that’s being overlooked. Hold Fast, adapted from the beloved novel by Kevin Major (which I’m ashamed to admit I haven’t read), is a nice coming-of-age tale set against the scenic Newfoundland landscape. The scenery is stunning and the story is stirring, so this nice little film offers a moving tale of growing up and finding oneself in the freedom of the expansive wilderness. Hold Fast includes Molly Parker in a notable supporting role as Aunt Ellen, who takes Michael (newcomer Avery Ash) into her care when his parents are killed in a car accident. Aunt Ellen sports the same thick accent that Michael brings with him to the city after moving away from his seaside town. Their thick coastal brogue marks them both as outsiders. Michael doesn’t adapt to city life nearly as well as his aunt does, though, for teasing and fistfights mark his days at his new school. Home life isn’t especially great for either of them, nor is it for Michael’s cousin Curtis (newcomer Douglas Sullivan), since Ellen’s husband Ted (Aiden Flynn) is an old-stock patriarch who stifles his family with rules and rage. Boys will be boys, so Michael and Curtis decide that they’re fed up with Ted’s crap and they hit the road Huckleberry Finn style. Hold Fast is less Mud and more Anne of Green Gables in its coming-of-age tale, for the runaways mostly encounter conventional entertainment in the form of a few friendly drivers who give them a lift from Point A to Point B. The move away from the city towards the magnetic power of Gros Morne, however, brings out a down-to-earth folksiness in the Canucks the boys encounter during their travels. Even a seemingly mean security guard happens to pull through in the end. 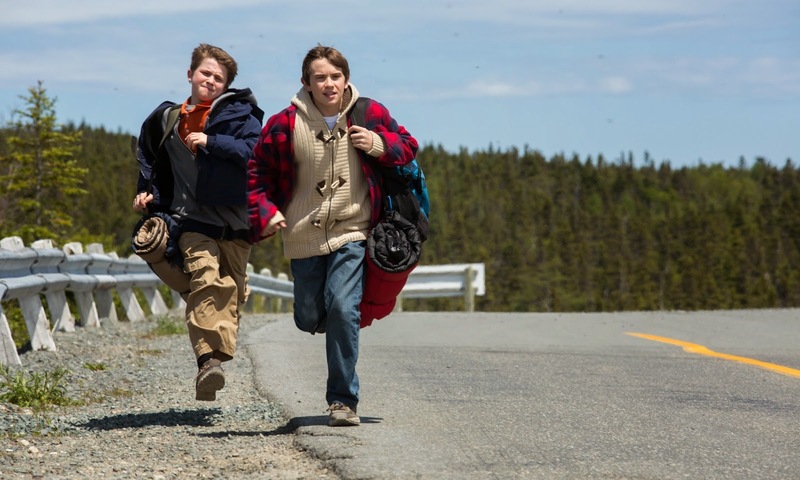 Coming-of-age in sunny Newfoundland seems freeing and harmless, and Hold Fast is pleasant to absorb and appreciate even if the boys seem safe every step of the way. Compared to grumpy Uncle Ted, the friendly country folk of Hold Fast harken nostalgia for a place and time where people knew and helped their neighbours. Perhaps Aunt Ellen’s kindness is innate. Hold Fast underscores the innocence of the boys’ quest to find themselves at home using effectively poignant songs by Mark Bragg and Katie Bragg. A Celtic tune to the soundtrack, similarly, affords a refreshing sense of place. The boys’ trek follows the typical journey that mirrors their coming-of-age with the distance they cross. Tackling their fears of heights, learning to live off the land, and fending for themselves, Michael and Curtis regain the confidence and independence that faded away at the house. Aunt Ellen, similarly, comes back into her own as Hold Fast crosscuts the boys’ escape with her own suffocation in the coolly-shot house back in the city. Ellen puts her own submissiveness to Ted in perspective with the boys’ departure, and Parker makes her character stronger and more assertive to offer the lost boys a spiritual guide during their journey. Director Justin Simms mostly lets the power of the natural surroundings take hold as Michael and Curtis hitchhike their way to the coast. Top marks go to Simms and cinematographer Catherine Lutes for framing the boys so naturally and innocently in their surroundings. (One striking shot foregrounds the flowers and tall grass as the boys assess their situation.) The majestic visuals are inspiring, although they might ultimately be more exciting than the boys are themselves. Newcomers Ash and Sullivan do their best to carry the film, and they’re fine in the boisterous moments that allow them to play around and run wild, but the emotional arc comes mostly through Parker’s ability to pull the dramatic weight of Hold Fast using only half the screen time. Simms nevertheless delivers a fun and wholesome coming-of-age tale that young viewers and parents can appreciate alike, so it’s nice that the accessibility of the film mirrors the story. Hold Fast is now available to rent/own on Google Play.